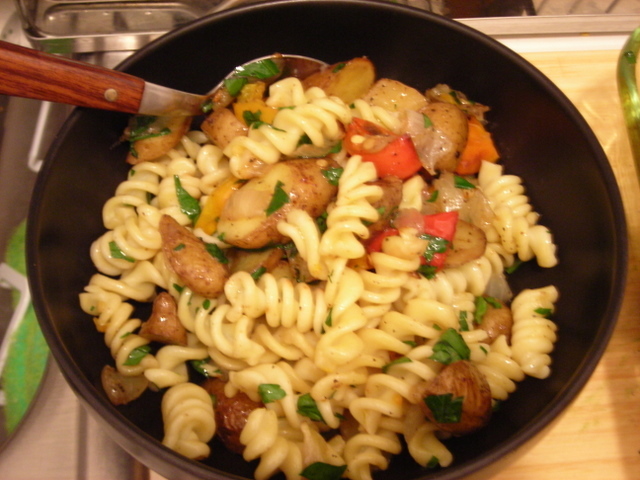 The idea of potatoes combined with pasta might seem a little strange to most people. This was inspired by pizzoccheri, a dish from the Lombardy region of Italy. The original uses buckwheat tagliatelle, cabbage or Swiss chard, sage and fontina cheese. My version ditches butter in favor of olive oil and contains no cheese. Simply toss sliced fingerling potatoes, peppers and Vidalia onion in 3 or 4 T. olive oil, a pinch of kosher salt and cracked black pepper, then roast in a 350 F oven for 35-40 minutes. When the vegetables are done, stir, then combine with cooked pasta and chopped parsley. Add a final drizzle of olive oil, check seasoning and serve immediately. Dessert was a slice of Alpine white cheddar cheese paired with peach butter, courtesy of a certain vendor from Vermont. If you’re a fan of preserves and jams, you owe it to your palate to check it out. Now I wish I had ordered more than one jar. 23 Oct	This entry was published on October 23, 2007 at 3:38 pm and is filed under food, general. Bookmark the permalink. Follow any comments here with the RSS feed for this post.